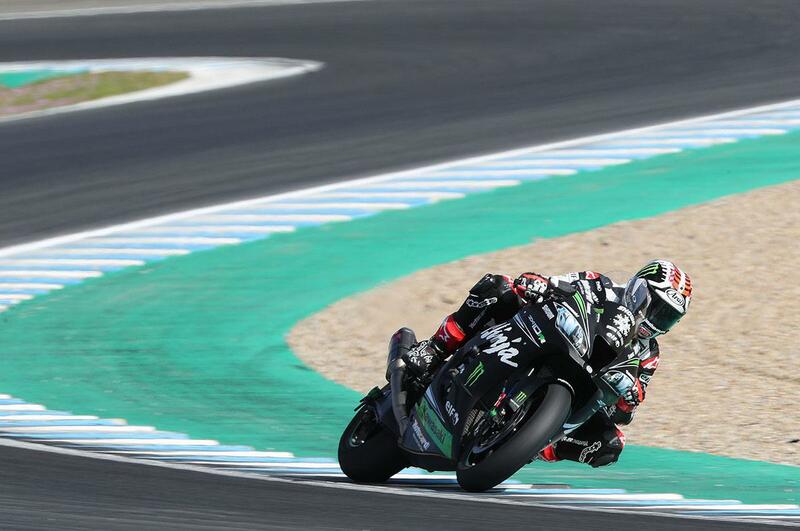 Four-time World Champion Jonathan Rea shot to the top of the timesheets as this week’s Jerez World Superbike test ended on Thursday afternoon. It was very much a test of two halves. Wednesday was an unusual day due to cool temperatures and a partially resurfaced track which combined to limit track activity and lap times, whereas a sunny Thursday had a more familiar feeling about it. Track temperatures hit 20 degrees Celsius in the shade and 27 in the sunshine. With an extra 600 revs to play with thanks to modifications on Kawasaki’s latest road-going ZX-10RR which translate back to the race bike, Rea lapped 1.5 seconds quicker than his own race lap record. The Northern Irishman claims to be more excited this year than any other, ending his test early and in confident mood. Alex Lowes and Michael van der Mark experimented with a raft of new parts on their PATA Yamahas. After leading on Day 1, the rapid Englishman was second on the final listings with a qualifying tyre onboard – completing a staggering 179 laps over the two days (more than any other rider) – while the Dutchman was seventh overall. Third was Rea’s new teammate Leon Haslam, the British Superbike Champion still re-adapting to the advanced electronic strategies used on the world scene. Alvaro Bautista continues to make progress with Ducati, although the former MotoGP man is yet to finalise a base setting with his Panigale V4R. More attention was on teammate Chaz Davies, who missed most of Thursday following a Turn 5 lowside at 4pm on Wednesday. The team claims an apparent muscle spasm in his back is not related to the crash, although neither rider nor Aruba Ducati representatives are keen to delve further into the matter at this point. For now, the official line is that Davies’ hitherto injured right shoulder is back up to full fitness. Toprak Razgatlioglu once again staked his claim as the dark horse, cracking the top five with Puccetti Kawasaki despite not liking the ‘slow’ Jerez track and running an older specification and less powerful engine. The Turkish charge will get his hands on the more potent Kawasaki power unit at the Phillip Island test next month. Sixth this week was GRT Yamaha’s Sandro Cortese, although Thursday brought his first WorldSBK crash after drifting onto the dusty kerbs under braking for the final corner. Eugene Laverty is pleased with his first Ducati test, getting to grips with basic but pivotal ergonomics such as seat and handlebar positions. The Irishman, who believes regular podium finishes will be possible in 2019, welcomed extra support from Ducati staff including long-time Shakey Byrne BSB crew chief Giovanni Crupi. BMW went all mysterious as they ran without transponders for most of the test, masking the lap times of Tom Sykes and Markus Reiterberger. Both the number of laps achieved and times were revealed by the team at the end of Thursday. Sykes’ test was heavily disrupted by a Turn 13 crash. Like Cortese just minutes earlier, the 2013 World Champion drifted onto the rumble strip under braking but, in an attempt to save himself, was flicked violently over the front of his bike which proceeded to launch itself over the barriers and through the protective fencing. Thankfully, the marshals and Sykes himself escaped unscathed from the frightening near-miss. Secrecy is the name of the game for the HRC-backed Moriwaki Honda squad of Leon Camier and series returnee Ryuichi Kiyonari. Neither rider was present in Spain, instead testing at Buriram in Thailand. The sole Fireblade in Jerez was that of Alessandro Delbianco but his Althea machine is not an HRC-related project. Testing will continue at Portimao, Portugal on Sunday and Monday.